You will get relaxed by watching these dogs get their massage! Dog Arthritis | Sacramento Dog Pain Relief | What Can I Give My Dog For Pain? Are you searching for glucosamine for dogs? Does your dog suffer from pain and possible arthritis, that makes you wonder whether you should seek out aspirin for dogs? Is your dog limping? Is your dog having trouble jumping or standing on its hind legs? Do you need dog pain relief that's gentle? Dog joint pain, dog hip dysplasia, dog arthritis treatment- have you sought out professional help for the dog pain? If you've been told by your veterinarian you feel that your dog may need medication or surgery, you may want to seek out a Myofascial Release therapist for your dog, cat, or horse. 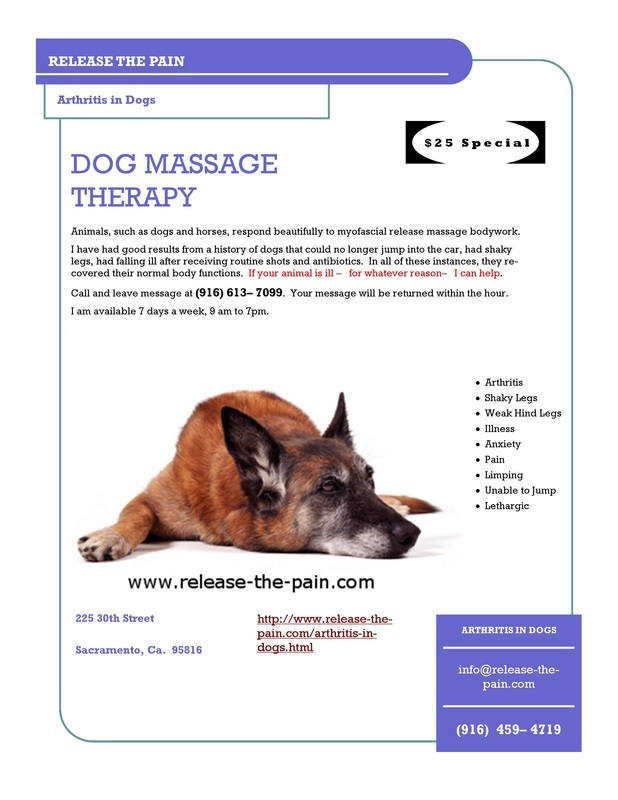 I live in Sacramento and I have been very successful with helping the animal's body release of myofascial connective tissue, which results in getting the pet back to a healthy pain free and functioning state. If you live outside of Sacramento, CA, seek out a massage therapist or bodyworker that has studied under John F. Barnes in his Myofascial Release classes. They can help your dog, cat, or horse with their fascial restrictions. Additionally, animals enjoy the physical, emotional, and mental releases from having dog massages. I have found that many dogs are like 'sponges' and take in a lot of their owners' emotional stresses, besides the physical traumas that build up over time that they contain within their body. Example #1: 18 year old dog with signs of arthritis and pain in movement. Crooked posture and backyard in cement foundation. After 1 session dog stood strong, body straight, alert and ready to play. Example #2: 14 year old dog no longer could jump into car, as it was very painful. Vet told the owner that the pet suffered from arthritis. Hind legs support looked weak. After 1 session dogs hind was higher and appeared strong and supported. The dog was asked to "dance" and the dog jumped up to standing only on the hind legs and proceeded to dance around in a circle. Normally, the owner said. the dog would falter and be unable to do this because of pain. Example #3: Dog's hind legs have had tremors and shakes for years. After a few minutes of hands on myofascial release, the shakes decreased immediately.. Example #4. A potbelly pig was not acting her usually self. All she did was lay on the floor, in the same spot and would not get up or move around very much. I did bodywork on her with gentle massage and immediately she sprung up like she was ready for action. She headed for the sliding door to the backyard and her owner said that she hadn't done that for all day. Was became her active, healthy, normal self again. *For session duration between 10 to 20 minutes long. The following is taken from an article written by Mark Barnes, Equine Physical Therapist, MPT, to explain equine mayofascial release. If you own a horse or dog, I highly recommend you purchase Mark's excellent Equine video and guide. It only cost $75 (much less than what others charge for educational materials). It is informative and easy to understand so that you can assist your horse or dog yourself. You can learn more about it by clicking Mark's name and it will take you to his website. I share the article here to help you understand how Myofascial release can help your pet. You can read this article on Mark's website at www. somapt.com/equine. Mark is the son of John F. Barnes, PT, whom I gratefully learned Myofascial Release from. "Myofascial release is a manual therapy technique that is used to elongate foreshortened connective tissue and muscle. Fascia is another term for the connective tissue of the body that forms a three-dimensional system of support, cushion, and movement. The fascial system forms a web from head to (toe, paw,hoof) surrounding every muscle, bone, organ, blood vessel, nerve, and cell. Muscle is made up of 98% connective tissue with biochemicals attached that produce a shortening of the connective tissue strands (contraction). When the (person, dog, horse) is acutely injured or sustains repeated trauma from training, the fascial system tightens as a protective response." "Over time this can lead to poor muscular biomechanics, altered structural alignment, decreased strength and endurance, and produce overuse muscular compensations. Resultant is decreased performance and functional capacity of the (person, dog, horse). By elongating the fascial system we can restore the efficiency of this system. Therefore, restoring the natural abilities of coordination, strength, and power to the (person, dog, horse). During treatment the therapist identifies areas of hardness or tenderness and applies a gentle pressure into the tissue were the restriction is felt. This is held for 90-120 seconds following the releases through the connective tissue barriers. MFR works with great success, especially when utilized with other treatment techniques such as joint mobilization, therapeutic exercise programs, and orthopedic structural massage. The combination of these techniques are beneficial in creating pain free movement for the (person, dog, horse)." Irritability or unwillingness to work"
"Fascia is a tough connective tissue which spreads throughout the body in a three dimensional web from head to toe, paw, hoof. The fascia surrounds every muscle, bone, nerve, blood vessel and organ all the way down to the cellular level. The fascial system has three basic components: elastin (for stretch), collagen (for strength), and ground substance (a gel like substance that supports and protects the cell). Generally, the fascial system is one of support, stability, and cushion, forming ligaments, tendons, and fascial sheaths. It is also a system of locomotion and dynamic flexibility forming muscle." How does the fascial system respond to trauma? "As in humans, the tightening of the fascial system is a protective mechanism that is a response to trauma. This trauma may arise from an acute injury like a tendon strain, chronic compensatory overwork of muscles, or repetitive training techniques. Over time this can lead to poor muscular biomechanics, altered structural alignment, and decreased strength and endurance. This results in decreased performance and functional capacity of your body, dog, or horse." "Myofascial Release is a hands-on technique that facilitates a stretch into restricted soft tissues. A sustained pressure is applied into the tissue barrier; after 90-120 seconds the first release will be felt. The practitioner follows the release into a new tissue barrier and holds. After a few releases are felt the tissue will become soft and pliable. The restoration of length and health to the myofascial tissues will take the pressure off of the pain sensitive tissue like nerves and blood vessels, as well as restore alignment and mobility to the joints." How does Myofascial Release differ from Chiropractic Manipulation or Massage? "Myofascial release addresses the soft tissue restrictions that can lead to altered bony alignment, but does not directly manipulate the bone structure of the person, dog. horse." There are varying massage techniques used on horses, such as Swedish, Sports, Deep Tissue and Neuromuscular, all of which have benefits. In many cases, the elastic portion of the fascia is released with good short term results. Myofascial release provides long term results by engaging the entire fascial system and making permanent length changes to the tissue. By elongating the fascial system we can restore the efficiency within the neuromuscular elements and proper mechanical length of the connective tissues. Therefore restoring the natural abilities of coordination, strength, and power to the horse." As a dental hygienist, I have over 33 years experience cleaning teeth. With more awareness now on total holistic healthcare, people have become acutely aware that dogs need their teeth cleaned as much as we humans do and preferably without anesthesia. Dog teeth cleaning is done order to prevent dog gum disease (to save their teeth) and dog bad breath (to save our fresh air) ;). It's best to do this procedure without anesthesia, if possible. I have experienced most dogs love or don't mind getting their teeth cleaned and will patiently hold still for the procedure.